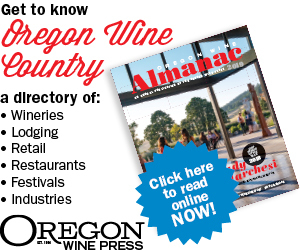 Oregon boasts the largest concentration of native Oregon white, black and brown truffles anywhere in the U.S. Each has a unique harvest season running throughout the year. This native harvest stimulates gourmet food chefs and gourmand foragers alike with its dignified harvest. I hoped this day would yield an edible surprise for me as well. As Westerners, we know from our ancestors that much of our culture and cuisine has roots in Old World Europe. The 18th-century French gastronome Brillat-Savarin called European truffles “the diamond of the kitchen.” Truffles today are highly coveted in French, Spanish, northern Italian and Greek cooking, as well as in international haute cuisine. But like other products European, truffles come with a price … a big one. By the current estimates of my newly acquainted truffle expert and guide, Charles Lefevre, Ph.D., of New World Truffieres in Eugene, he recently purchased a wholesale “bargain” on a couple pounds of Northern Italian white truffles for a mere $1,800 a pound. Some European white truffles sell for as much as $3,600 a pound, making them the most expensive food on earth. “My goal is to bring the tradition of Southern Europe’s successful truffle cultivation to America, where we have similar soils, climates and geographic parallels,” Lefevre said. After earning his Ph.D. in mycology from Oregon State University, this soft-spoken, Eugene native got busy in agri-business. It is important to note that Oregon truffles are a different species from the European. When European truffles are cultivated in Oregon, growers often add lime (calcium hydroxide) to raise the soil pH in order to create an environment conducive to the Old World variety. No matter their origin, all truffles are vital to their tree friends. Like above-ground mushrooms, they form networks of fungi that are mycorrhizal, supplying essential nutrients and water to a tree’s roots and, in turn, receiving sugars from the tree — a sort of indirect photosynthesis. Animals, like squirrels and rodents, depend on truffles for food. Truffles depend upon those animals — as well as those who prey on those animals — for spore distribution. And, of course, the animals depend on the trees as habitat, making an efficient eco-system. I was ready for the hunt, camera in hand, suiting up with Oregon layers on a brisk yet sunny day. Lefevre had a gallon milk jug, cut out on the top, belted to his side. Deborah Walker and husband, David, were armed with every tool of the trade hanging off their vests and belts. 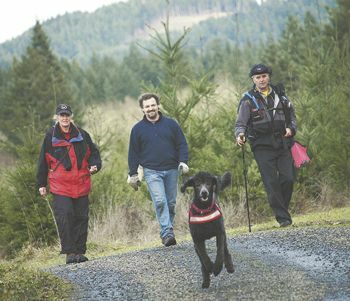 Deborah, as a certified K9 handler, had assigned Tucker, her less-than-a-year-old motivated Standard Poodle, as truffle locator. “We’re not only here to learn and observe; we’re here for some production,” commented Lefevre. Which hinted to me just why I really came … I delight in truffle dishes. Finally, I just might get my “fresh earth-to-the-table meal” I had envisioned. Yet, like fishing for the prize edible fish, this hunt would not come easy. We began weaving in and out, around and through a perfectly planted, thick grove of hundreds of Douglas firs. I felt like I was in Hobbit-land, soon to see Frodo. Tucker ran at a dizzying pace, sniffing here and there around the trees, then halting at specific patches of earth, pawing the ground. Then, with a bit of assistance from a spoon or shovel-like tool, it happened … right under the top two inches of organic groundcover — near the surface of the dark soil underneath — bingo! White garlic-sized truffles rolled out, glowing in the contrasting earth like little jewels. Lefevre routinely grabbed and sniffed them, dropped them in his jug, and on we moved. Later that day, we had three or so pints of truffles. And best of all, I got one pint to myself. For the curious, the hunt happened near Lorane (population 389), 30 or so miles southwest of Eugene. Charles contracts with landowners for rights to this sacred patch. As I left the hunting grounds, driving just a mile or two, I spotted King Estate Winery’s Coast Range foothills, covered with hundreds of acres of vineyards. Surely, the fertile soils producing my newly discovered native Oregon truffles have a relationship with the same soils producing fine wines. A stop for a little wine tasting helped me ponder the day. Later that evening I was invited — invitations do come graciously, even aggressively when you have fresh truffles from the field — to Eugene’s Osteria Sfizio Italian Restaurant for a fine meal à la fresh truffles. After devouring my verdure — greens topped with roasted organic beets, sliced heirloom apples, local fresh hazelnuts and Gorgonzola cheese — my entrée arrived. Fresh tortellini filled with pumpkin, ricotta and sage butter, covered with a generous portion of truffles — thinly sliced and prepared in a browned butter sauce — complemented a glass of 2008 Benton-Lane Pinot Noir. No meat whatsoever, and I was completely satisfied — a fantastic feature of truffle cuisine. Still wondering if my experience was a novelty of discovery and gastronomic delight, or if others shared this feeling. I decided to call other in-the-field professionals. Enter Toby Esthay, one of the renowned truffle foragers in Oregon. Esthay, an Oregon commercial harvester of mushrooms at large, moved to the Northwest from Louisiana in 2000. He discovered very little was known about truffle harvesting in North America. He now realizes no less than $20 per ounce wholesale — $320 per pound — for a fresh batch of truffles. Even Toby’s truffle dog, Appa, a beagle-lab mix, graced this month’s cover of Fungi Magazine. Today European gourmet truffle growers, who have long dreamed of growing them in America, are making in-roads. “At long last some farms are finally having success growing French black truffles over here — it may take 10 to 20 years from start-up to success,” said Britt Bunyard, Ph.D., editor-in-chief of Fungi Magazine. The most desired truffle is the French black, or Perigord. Perigords are mycorrhizal with hazelnut and a few species of oak, including holly oak. Again, soil has to be altered for this type of truffle to thrive. If all this truffle talk has you wondering if it’s a fanciful fad or an emerging staple in America, just ask Don Crank, winemaker at Willamette Valley Vineyards. After a day’s meeting with Lefevre, Crank was dared to hunt in a stand of Douglas fir just below their vineyard property. As a truffler who has now told his tale, I firmly agree.